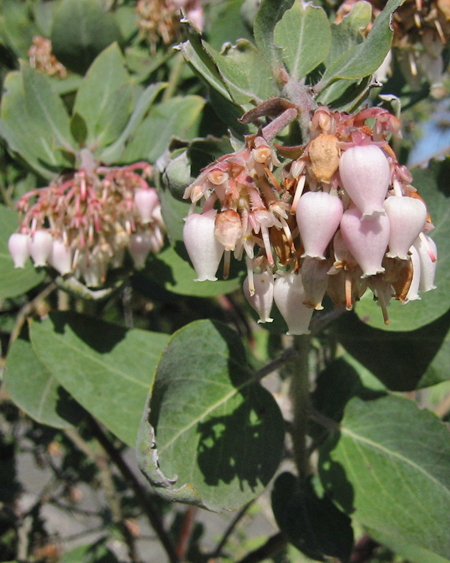 Whiteleaf manzanita is a broadleaf evergreen shrub, native to the Pacific coast from California up to Southern Oregon. Green-gray foliage and red bark make a showy planting amongst boulders with a mulch layer, aesthetically excellent combined with oaks or pines. Commonly found in the wild on red clay and decomposed granite, but also lives on serpentine. Flowers bloom white in spring, and flowers are followed by edible drupes, thus creating substantial habitat for native wildlife. Truly an enjoyable species to add to your landscape. Categories: All Plants, Broadleaf Evergreens, Native Plants, Plants for pollinators, More..